A Scamp RV is the perfect lightweight travel trailer for a couple on the go. Built to order and available in three sizes, 13', 16' and the 19' Scamp 5th wheel, they are made of fiberglass construction, and are both durable and surprisingly roomy for such a small space. The fiberglass means that they are incredibly lightweight, which makes them less of a drag on a long journey and will not take away much from the gas mileage of the vehicle. The RV fifth wheel has a queen size bed in the loft and steps up to the loft, with options for a side bathroom and rooftop AC. Those with mobility issues can discuss their particular needs with Scamp directly, although a common solution is to have the whole trailer on one level and to make the bathroom much smaller. 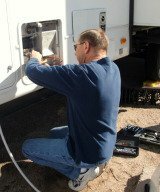 With the smaller bathroom, the Scamp RV is built without a shower, but most RV parks provide special accommodations for their disabled clients. All features which contribute to the RVers comfort. The basic package for Scamp RV travel trailers comes with laminate wood-effect panels and Formica countertops, which are included in the basic price. Each model starts with the basic set up of a queen size bed, bathroom and a small stove, and from here, the sky is the limit. Awnings – These make it possible to sit outside in both rainy and extremely sunny weather while being protected from the elements. The awning can either clip onto the outside of the RV or attach directly as a roll. Additional fly screens and wind protectors are available to give RV owners an extra room. Furnaces – One of the main drawbacks of RV traveling is that the internal temperature of the vehicle is dependent on the weather outside. A simple furnace adds a little extra weight to the trailer but means that it can be heated to normal temperatures all year round in all kinds of weather. Air conditioning – The flipside of the lack of heat is that the fiberglass can act as a glasshouse in hot weather, making it uncomfortable to sleep. An air conditioning system solves this problem, but if you are using a generator, rather than hooked up directly to power, it will put a lot of strain on the generator as well as costing a lot of money to run. The Scamp 19-foot model has a hitch weight of 400 pounds without any additional extras. It will be important to get an idea of how much any customized extras will weigh before having them installed so as not to overload the towing vehicle. A friend had a Scamp and it only took one visit for me to decide that it I was traveling alone, I have me one. Had all the comforts of home, was easy to pull and...just plain cute! 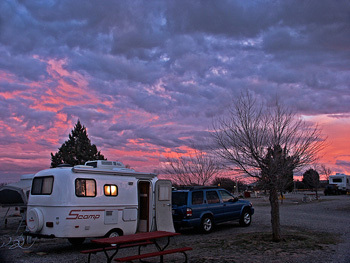 Besides representing good value for the money, Scamp RV travel trailers have a great reputation. Specifically aerodynamically designed, small vehicles can easily tow these travel trailers. Among the market leaders in terms of being easy to set up, they are dependable, adaptable to changing temperatures, and built to last. A Scamp trailer could easily accommodate extended RV traveling or full time RVing with the basic necessities. Scamp RV Trailers on eBay.